When I first set off on my See-the-USA-in-an-RV trip back in May of ’14 I brought with me a little, 120 watt portable solar panel kit with the idea it would generate a little electricity and cut down a little on how long each day I’d need to run my generator, and it has. As time has passed and my explorations into the scintillating world of sunshine and solar have progressed I’ve learned more and more about the whole solar thing. Learning about this sort of stuff is fun and has practical benefits, one of which led me to replace the controller on my solar panel kit and this has allowed me to go generator free for the most part since then. One of the hard parts about making educated decisions about things such as which solar panel or system to buy is that you just can’t make an educated decision when “you be iggerunt”. Such was the case when I bought my GoPower PSK-120 portable solar panel kit which I’ve reported on separately here. One of the things I wrote about in my report on the GoPower kit was the placement of the charge controller, the device that controls how much of the electricity generated by you solar panels is sent to your batteries and when. I’ve learned more about this very recently. I suppose it would be fair to say that in my initial report I complained that the controller was glued to the back of the solar panel which necessitated shipping the entire kit in the event the controller needed repair or replacement. Now that’s just dumb. Why not make it easily detachable so that you can send this itsy bitsy device, the controller, through the mail in an itsy bitsy package for a buck and change instead of having to deal with the huge hassle and expense of shipping a humungous 35 pound solar panel at great expense and inconvenience? It don’t make no sense. Its just plumb dumb. (Note: In July of 2015 GoPower informed me that they have modified the method by which they attach the controller in the PSK-120 kit so that it is no longer glued to the back of the panel.) It’s also dumb to put a non-waterproof device on a solar panel made for outdoor use. That’s all old stuff in my original report. EPSOLAR charge controller used in the GP-PSK-120 sold to me. I replaced it with a Blue Sky Sun Charger 30. What I’ve recently learned, and from where the title of this article comes, is that there are a couple other reasons that gluing a charge controller onto the back of a solar panel is not a good idea. The first is that it might create a hot spot because it inhibits cooling in that area of the panel and may even generate heat as a byproduct of its operation. Hotspots on solar panels are not good and can ruin them. Next, every inch of wire between a solar controller and the batteries it is intended to charge represents a loss of voltage due to resistance inherent in the wire. I can understand why GoPower put the controller on the panel. I mean, where else can they put it if they want to sell a panel that is plug and play, where you don’t have to perform a separate installation of the controller? It’s just that I want you to know if you don’t know already that placing the charge controller as close to the batteries as possible is a better idea, especially when the wire run from the panel to the batteries is long. Charge controllers are set-up to provide a certain amount of voltage to the batteries at certain stages of charging. Here I refer to multi-stage controllers which describes many if not most contemporary solar charge controllers. If there is a long wire run, or wire that isn’t heavy enough, or both, between your controller and your batteries, the amount of voltage sent by your controller can and most likely will be reduced due to the resistance in the wire. For example, your controller may be sending 14.4 volts but the batteries may only be receiving 13.4. This describes my situation where the wire run is 40′. The result will be batteries that never get fully charged. Then, when you decide you’re not getting enough electricity from your solar to run your TV, your Mr. Coffee… whatever, you go out and buy more solar panels and more batteries at great expense when really all you needed was to move your charge controller closer to your batteries. It’s 10 o’clock, do you know where your charge controller is? Are you with me now? I am far from an expert on any of this, but I’m learning and have learned quite a bit. One resource from which I have learned quite a bit and which I have enjoyed is HandyBob’s Solar blog. 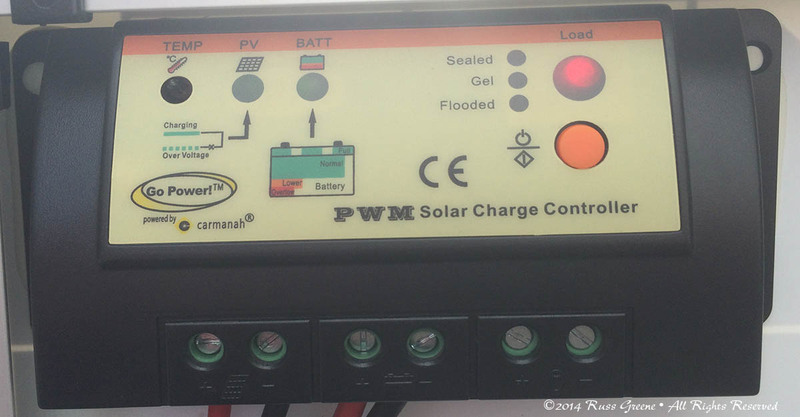 If you’re keen on learning about solar for your RV and why much of the advice you get from solar dealers is to be trusted only about as far as you can throw a piano, start there, with his RV Battery Charging Puzzle. You’ll be doing yourself a huge favor. I have also condensced a lot of what I have learned into my article Things I have Learned About Solar Power which is jam packed with very useful information. Could you expand a bit on your controller replacement? What did you replace it with? Did you move it inside the RV, or use heavier wire? I’ve purchased a Renogy portable solar suitcase, 100 watts, and have been wondering about the loss with its run between the panel-mounted controller and the batteries. Haven’t used it yet since I’m in a hookup RV park for a couple more weeks. My new controller is a Sun Charger 30 made by Blue Sky. It is a PWM (pulse width modulation) device that cost me about $150 from Northern Arizona Wind & Solar, a company with a good reputation from what I hear and my limited experience with them would seem to support that. The reason I selected this controller was because of its flexibility, feedback and economy. My old controller kept me almost completely in the dark. It had a few idiot lights that didn’t tell me much. The Sun Charger 30 has a digital display which during the Charge ON mode shows charging voltage output, amperage output, and how many ampere hours have been sent to the batteries since the last time the ampere hour counter was reset. (It seems to reset automatically whenever the panels are disconnected from the batteries and can be reset manually at any time.) I like knowing these things and the information is very useful. The Sun Charger 30 is extensively user programmable providing the flexibility I mentioned above. Many if not most inexpensive controllers allow you to set the kind of batteries you are charging but nothing else. Based on your selection the controller sends electricity to your batteries based on its internal, set-at-the-factory programming. (I tend to agree with HandyBob that the settings configured at the factories that make these things are as if battery manufacturers and solar controller makers never talk to each other about what these settings should be.) With the Sun Charger 30 the factory defaults can be overridden and adjusted to situational particulars by the user. That’s both good and bad. It’s good if you know what you are doing, bad if you don’t. In my case I’d say it’s half of each but I’m moving in the right direction 🙂 This flexibility has shown itself to be valuable in my situation as I have definitely seen more charge getting to my batteries than with the old controller. My plan is to use heavier wires from the panels to my RV and also to install the controller somewhere in my RV much closer to my batteries, but for right now it is mounted on the frame of my solar panel kit, connected to my RV with either the 10′ cord that came with the kit or the 10′ cord that came with the kit plus the 30′ cord that I purchased separately from the kit maker. The programming flexibility of the Sun Charger 30 has allowed me to compensate to some degree for the loss of voltage due to the length of the wire run in my current circumstances. I’ve turned up the voltage at the controller. By the time it reaches my batteries it has fallen some due to the length of the wires, but by turning it up at the controller it is closer to where it should be at the batteries. There are caveats to doing this and it is not the best way to go about things as it can cause over-voltage problems under some circumstances. Moving the controller closer to the batteries as is my plan is a better idea. I’ve seen the Renogy 100 watt kit. My next door neighbor where I am parked now has one. I didn’t examine it closely, but as I recall the wire from the controller to the RV looked similar to household extension cord. I do not know length or gauge it is (“gauge” is the electronics term for thickness–for readers that may not be familiar with the term). You can approximate the loss of voltage for a given length and gauge of wire using one of the online calculators such as this one. You can also measure it with the proper meters. Thanks Russ. By any chance would that neighbor be John? If so, he’s the one who emailed me about your blog. I liked the Imperial Dam posts. We’re headed that way in March. Well, I’m glad you got something from the article. I can’t say whether or not your system might be overkill but I can offer some ideas on assessing it. My understanding, which again is the very basic understanding of a relative solar newbie, is that the general equation is fairly straight forward. Start by figuring how much electricity you use or would like to use and then size your battery bank and solar panel array accordingly. OK, so how is that accomplished? HandyBob is a big fan of recording meters which, when installed, keep track of all the electricity used and all that is generated by the solar system. Personally, I’ve never used one of these which isn’t to say I wouldn’t like to have one. I would. There is some expense in having one installed, an investment I have been reluctant to undertake in part because I never intended to keep my coach very long. If I recall correctly one of these can be installed prior to installing solar panels and batteries in order to learn more about one’s use of electricity–how much you use. Another approach would be to make a list of every electrical device you use, how much electricity it requires, and how long you might use it for on any given day. I’d go by the worst case scenario, for lack of a better way of saying it. In other words, when the days are shorter you would use your lighting more, maybe watch more TV because you’re inside longer. Like that. Most product manuals for appliances list the power requirements in the Specifications section, frequently in terms of watts. Many devices have the information right on the device itself, printed on some sort of label. If this information cannot be located on the appliance and the manual is not where you can find it, a PDF manual with the information can sometimes be found on the manufacturer’s web site or by contacting them via email or phone. There are also ways of measuring power consumption such as an inexpensive device called a KILL A WATT. It plugs into 110 volt AC wall outlets, the same outlets into which you plug your toaster, etc. Then you plug an appliance into the KILL A WATT and it tells you how much electricity it uses. Once you know how much electricity you are likely to use it becomes much less of a mystery as to how many solar panels and batteries you need. Well, it is 11 o’clock here and I’m remembering that we are trying to decide wether or not to put solar panels on our house or not. very different technology than for your RV-but you have made very interesting observations and learned a lot in these last 9 or ten months of traveling. I feel it is a good thing because we should all if we can try to use as much natural energy as we can for a cleaner and lighter footprint existence on our beautiful planet. Not just in RV’s but houses too. And not just to save money but to blaze a trail for the future of cleaner energy. Have you noticed the moon these last two nights? I’m not sure how well you see it in the dessert surrounded by mountains, but with the north star just below it looks like the Turkish flag! Never mind- you are talking about solar and technology and I’m talking about the moon! Your tour in the RV is definitely an educational one in all directions! Rock on! Maybe some day we will develop technology sensitive enough to create electricity from moonlight–lunar power. After all, it’s just sunlight reflected off the moon! Russ, thanks for the heads up on a part of the solar puzzle. 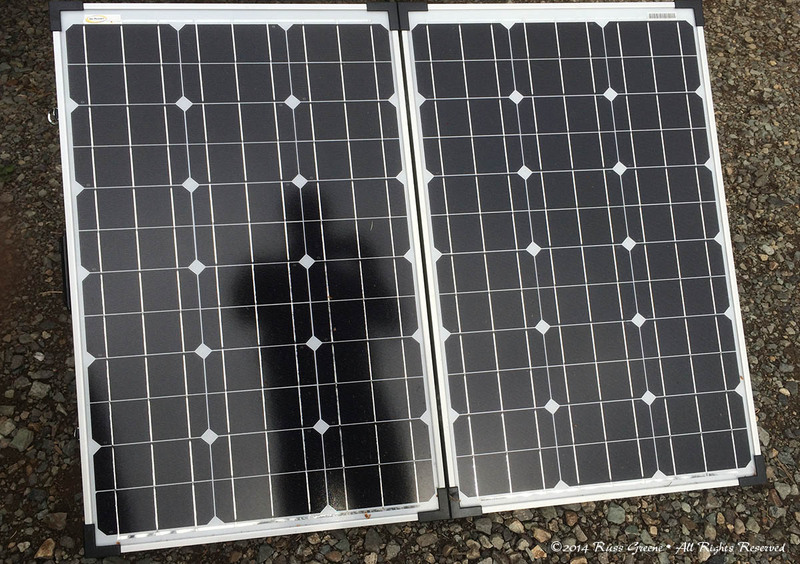 Makes good sense and should be helpful when I pull the trigger on solar for my RV.